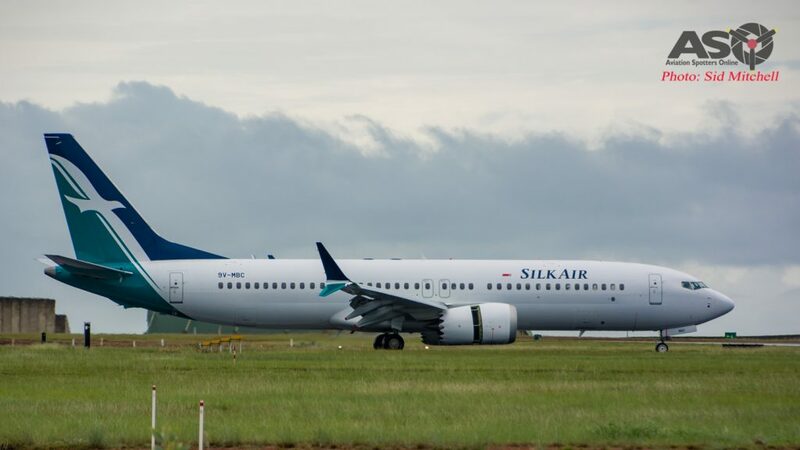 On Sunday 7th January 2018 the Top End monsoon wasn’t enough to dampen the arrival of SilkAir’s inaugural Boeing B737 MAX 8 passenger service to Australia. 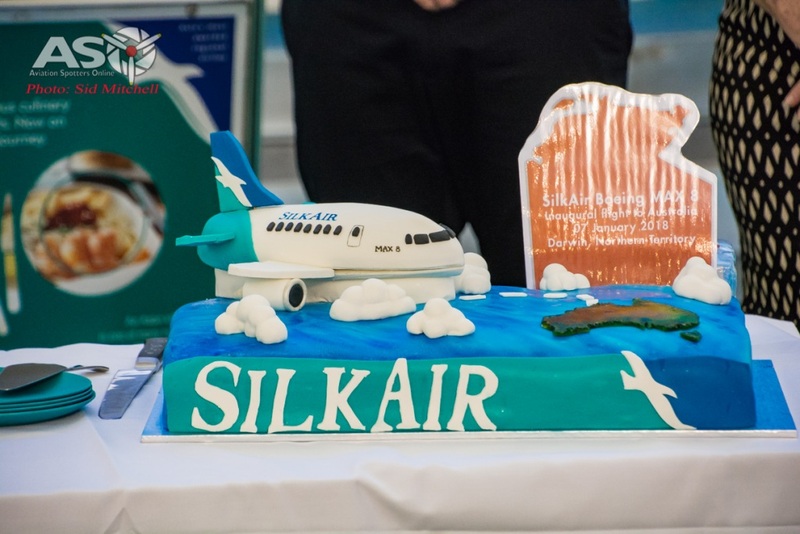 The event opens a new chapter in the ongoing 6th year partnership between SilkAir – The Regional Wing of Singapore Airlines, and Darwin International Airport in the Northern Territory, Australia. Although the Singapore – Darwin service isn’t new, the aircraft type certainly is, as SilkAir now operates three Boeing 737 MAX 8’s in their fleet, 9V-MBA, 9V-MBB and todays visitor, 9V-MBC. 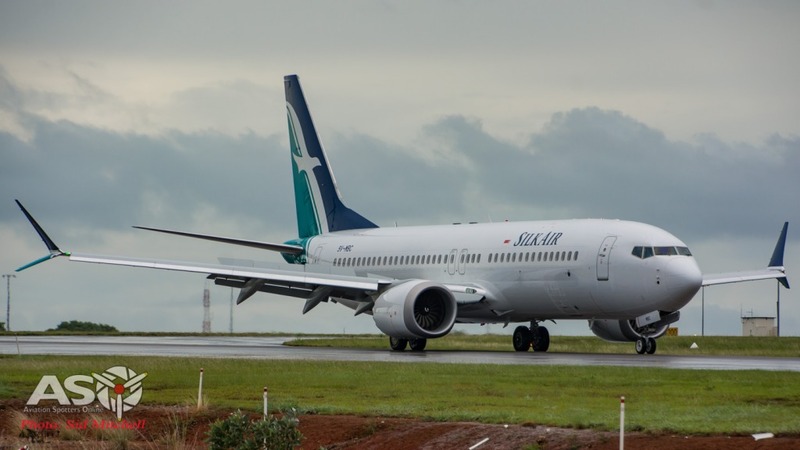 However SilkAir will also be adding a further two services from Singapore’s Changi International Airport bringing it to six per week. 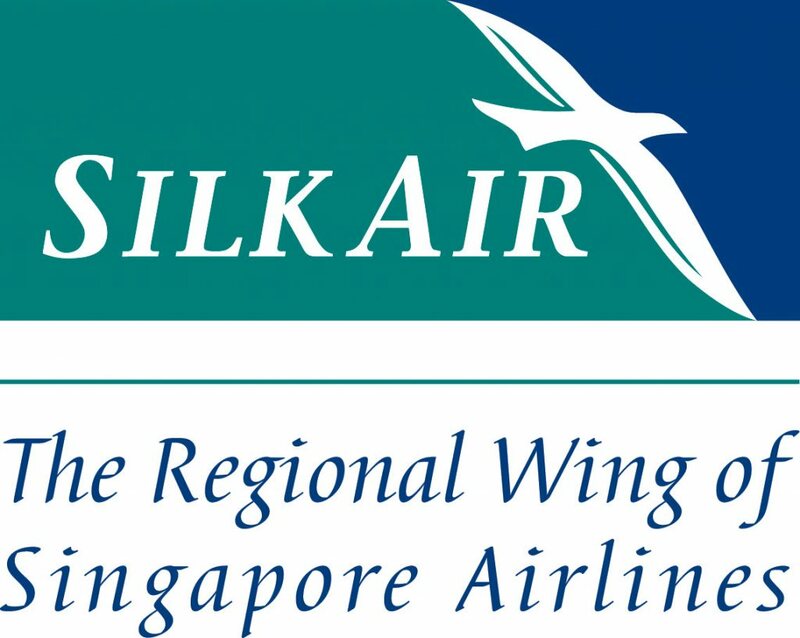 SilkAir 801 departed Gate E20, Terminal 2 at Changi International Airport, lifting off at 0856 local time on it’s 4H 40min flight of 3,345km to Darwin, cruising most of the journey at about 850km/h at an altitude of 10,680m. 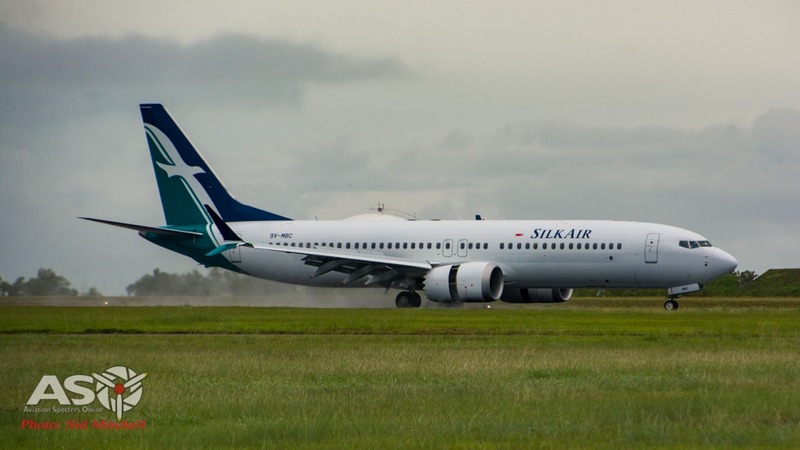 SilkAir 801 about to touchdown in Darwin. 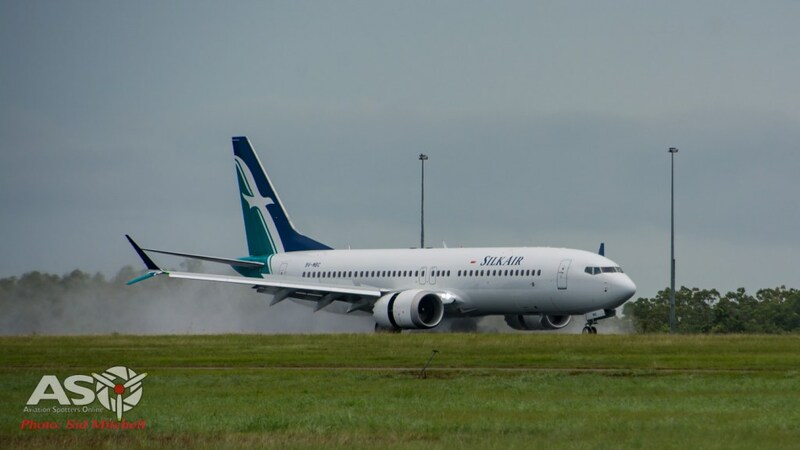 Touching down in Darwin on a damp Runway 29 at 2:36pm local time, during a well timed break in the rain, 9V-MBC as Silkair 801 (MI801), greeted the viewing public with a spray of water as the crew applied thrust reversers of the new LEAP-1B engines. The MAX 8 slowed and exited the runway via B2 and taxied towards the terminal apron. Damp arrival of B737 MAX 8 9V-MBC. 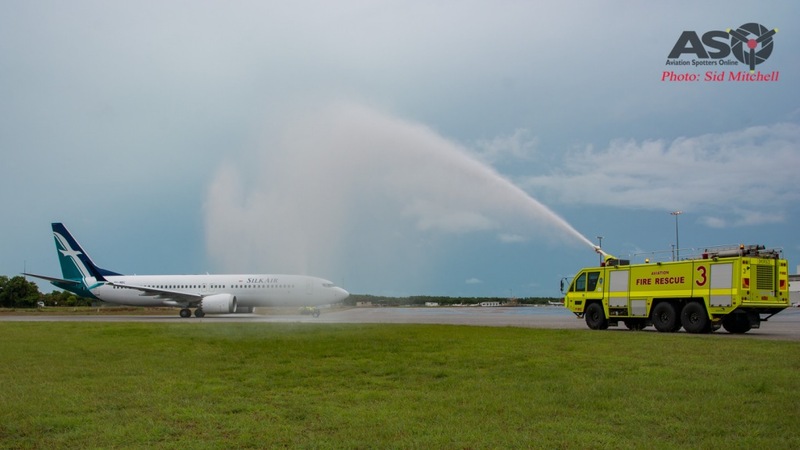 As on other special occasions, a water salute had been arranged by the airport authorities to greet SLK801 as it taxied to Bay 3 at the Darwin International Terminal. Tender 1 – Rosenbauer Panther. 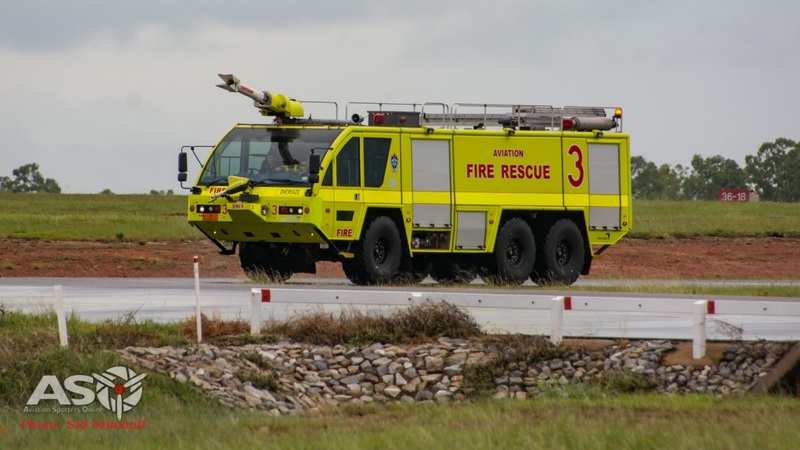 Tender 2 – another Airservices ARFF Rosenbauer Panther. 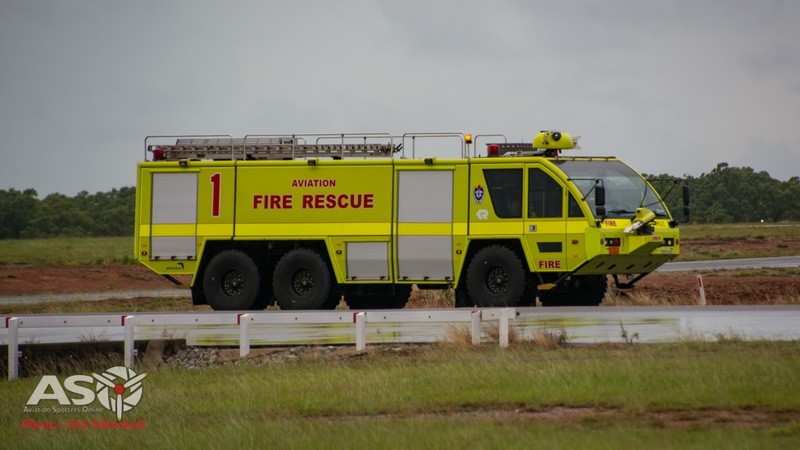 ARFF Tenders 1 and 3, a pair of Air Services Rosenbauer Panther fire trucks from Darwin’s Aviation Rescue Fire Service, had pre positioned themselves and opened up their monitors creating an crossing arc of water for the aircraft to slowly taxi through. A great job by the ARFF teams considering only 15 minutes earlier they had been responding to an alarm elsewhere at the airport. Welcome to Darwin International Airport. 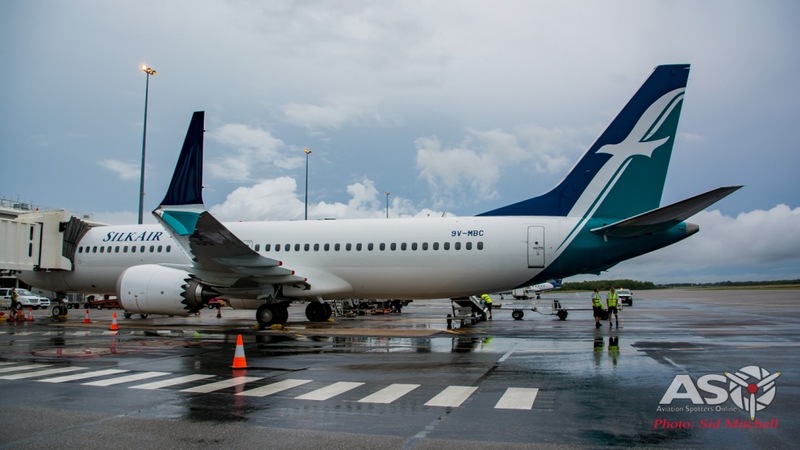 Once past the water salute, Captain Salazar picked up the ground handling team waiting at Bay 3, who proceded to manually marshal the aircraft into its final parking position at the airbridge. Normally the aircraft taxi/parking indicators are provided automatically up in the bay, but for today’s special occasion, manual guidance into position was chosen. 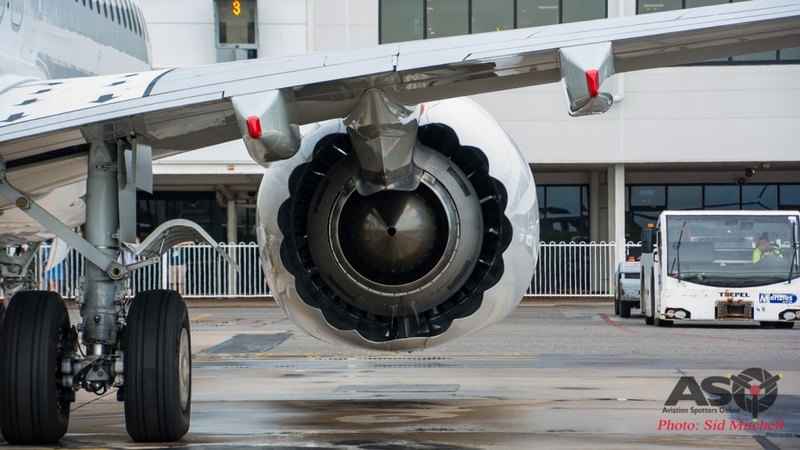 With nosewheel chocks in place, ground comunications to the cockpit is made and final parking procedures performed – main landing gear chocks in position and airbridge connection made before the entrance cabin door is opened. 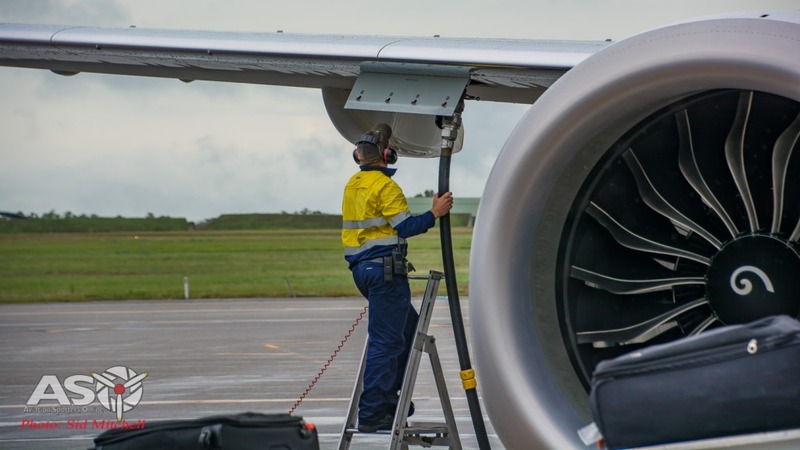 While the flight crew and passengers proceeded with disembarking to the international lounge and customs area, service crews began their individual tasks both inside and outside the aircraft, aiming to have it turned around ready for the return flight to Singapore. Most passengers never see all the activity that occurs in and around the aircraft while they sit inside the terminal waiting to board their flights. 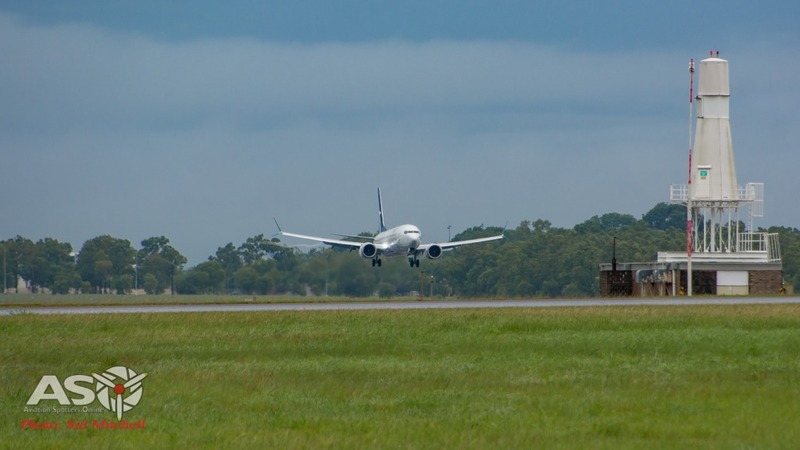 Darwin Airport does offer a number of great viewing areas to observe the activity, from the Dome cafe and Hector’s bar, to the seating area near Gate 4. 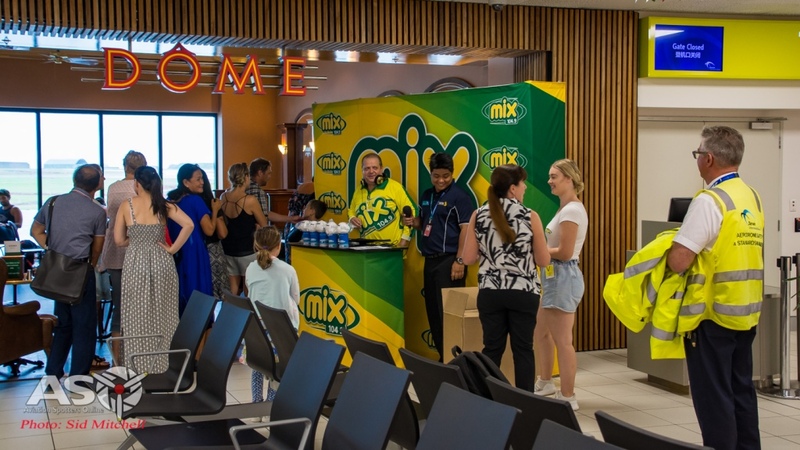 And to help celebrate today’s arrival, local radio station MIX 104.9 FM has been running a competition promoting Silk Air and it’s many destinations – the team had set up and were broadcasting from the upper level of the Terminal. The team from MIX 104.9 FM having a ball. 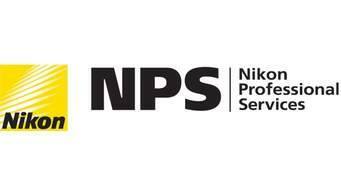 Back downstairs functions such as baggage handling, catering services, aircraft inspection to refueling and ablutions – all need to be performed to meet the next scheduled flight. 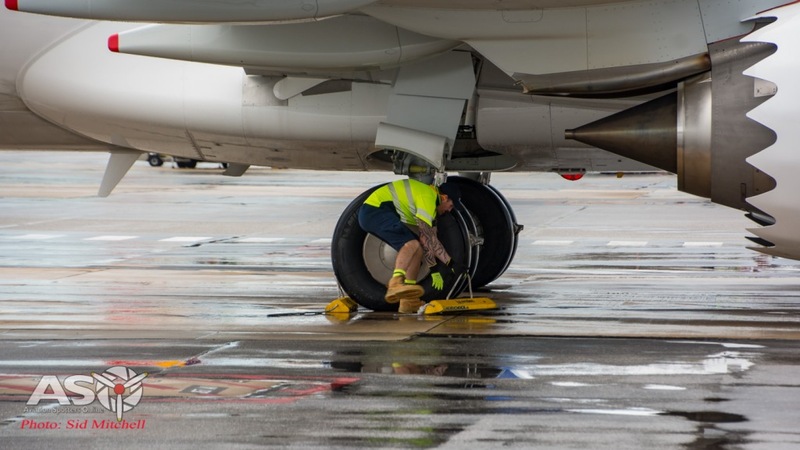 I was able to observe these activities at ground level today thanks to Bob, the Aerodrome Safety & Standards Manager at Northern Territory Airports Pty Ltd, who escorted me airside for the arrival. Bob has been at the airport for two decades and has an enormous amount of aviation knowledge about the Top End. 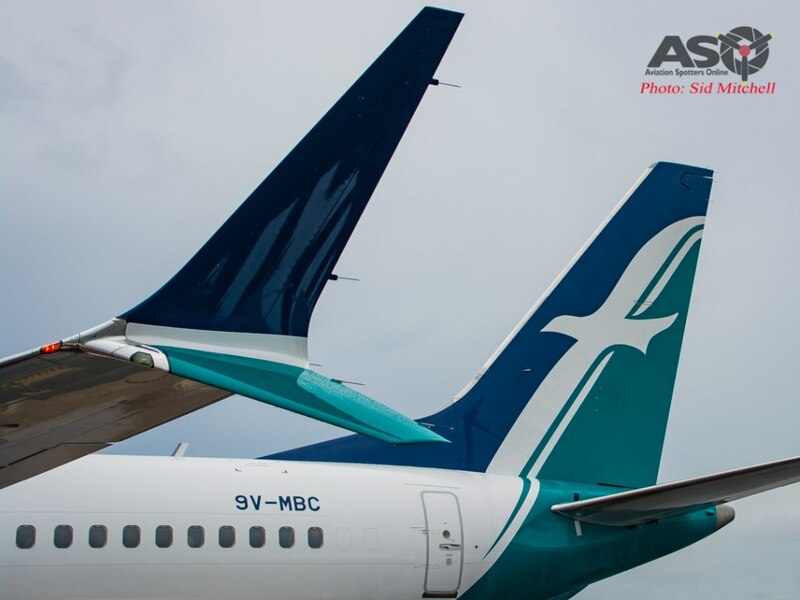 The distinct trailing edge chevrons help reduce noise. We walked around the bay as the groundcrew performed their tasks, which also allowed me to take some photo’s from a vantage point I don’t see very often. 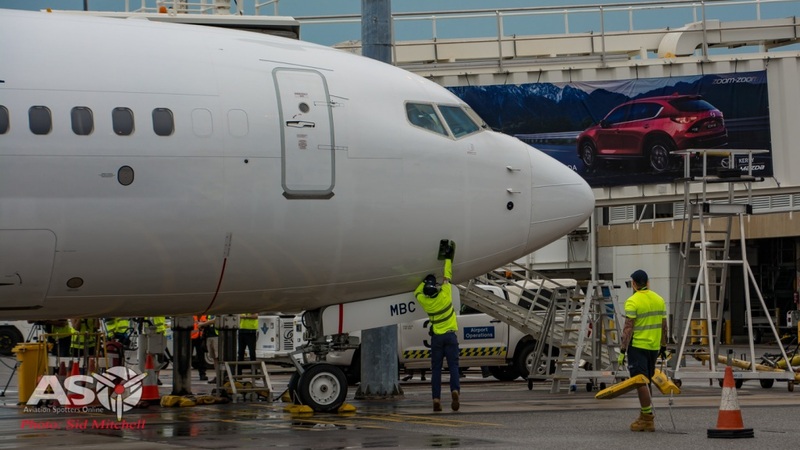 The B737 MAX 8 has a few subtle differences from the standard 737, sitting slightly higher at the front and Bob also pointed out the extra dimension of the downward facing winglets that could catch an unwary driver. 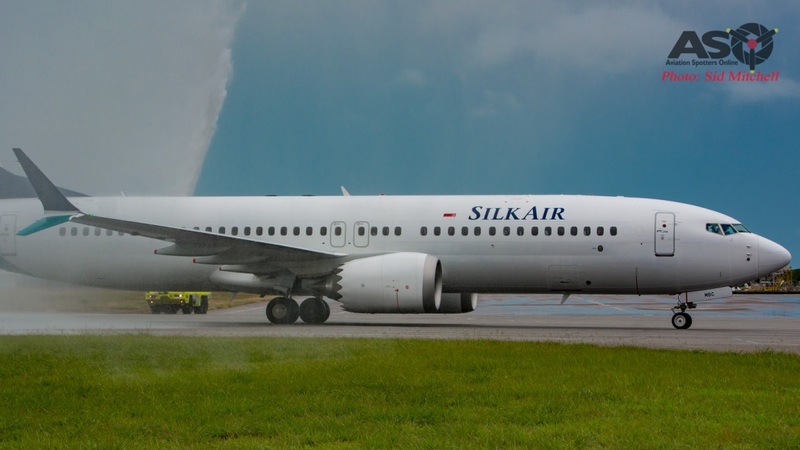 Once finished we left the apron and arrived inside the terminal so see the end of Silk Air’s welcome ceremony. 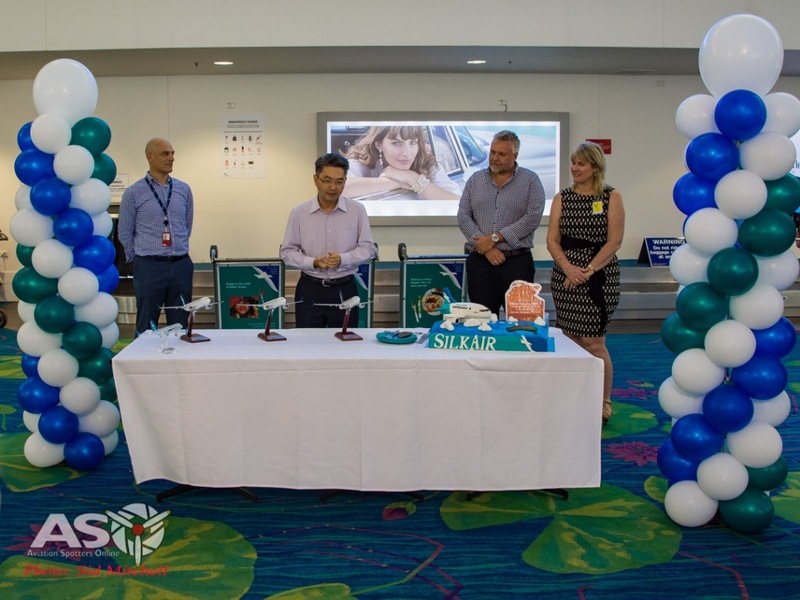 Mr Foo Chai Woo, the Cheif Executive of SilkAir, acting Minister for NT Tourism, Eva Lawler and acting CEO of Darwin Internantional Airport, Tom Ganley were all on hand to close the celebration with a cake cutting ceremony. Mr Foo Chai Woo, the Cheif Executive of SilkAir speaking about the new services and aircraft. 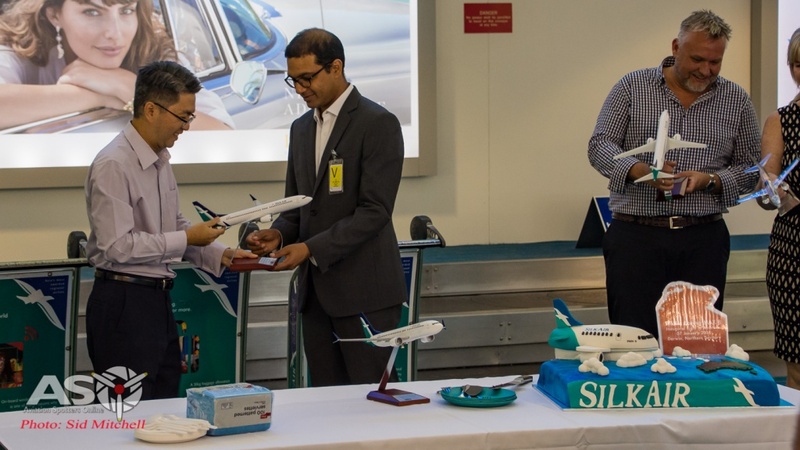 After several desk models of the B737 Max 8 painted in the SilkAir livery are presented by Mr Foo Chai Woo, Jill, from NT Airports Communications & Media Office explains we have been invited go aboard MI801 and take some photographs. 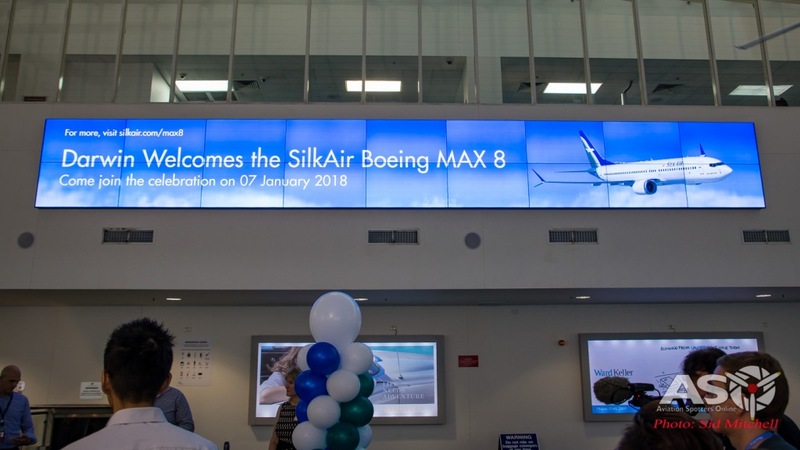 Some desktop B737 Max 8 presentations – both wood and perspex in the SilkAir livery. 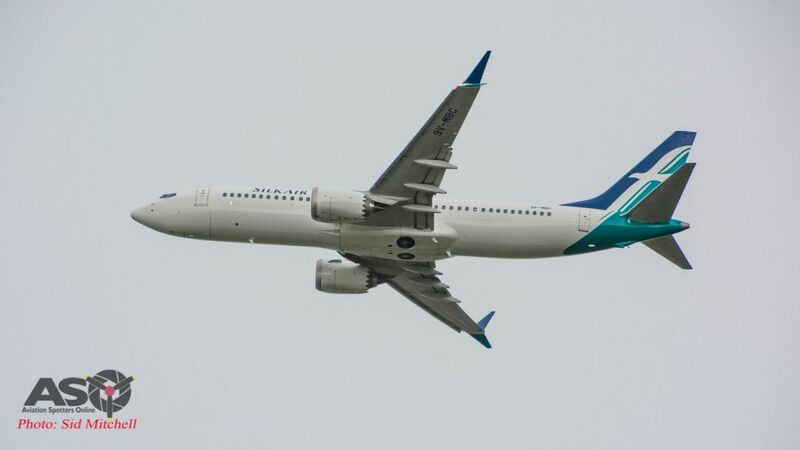 This version of the B737 is configured as 12/144 – that is, 12 Enhanced Business Class seats and 144 Economy Class seats. 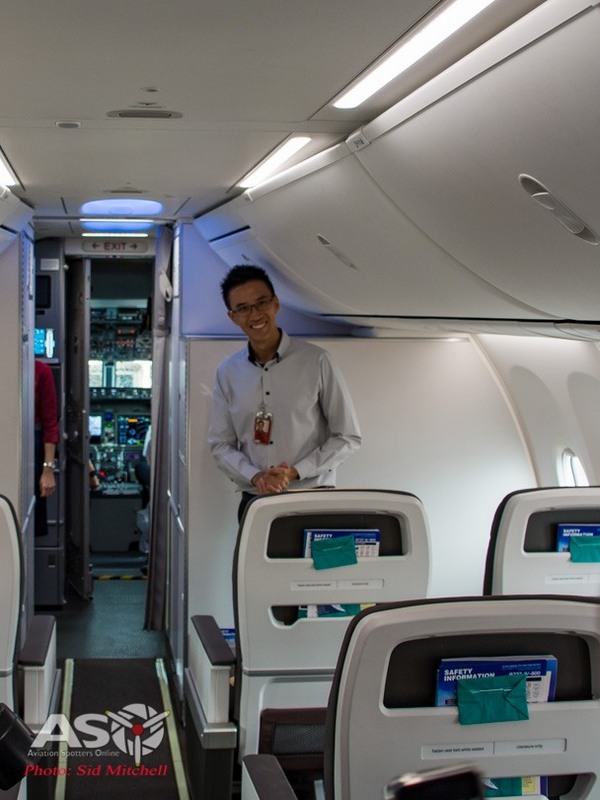 What is apparent when entering the MAX 8 cabin is the extra room. 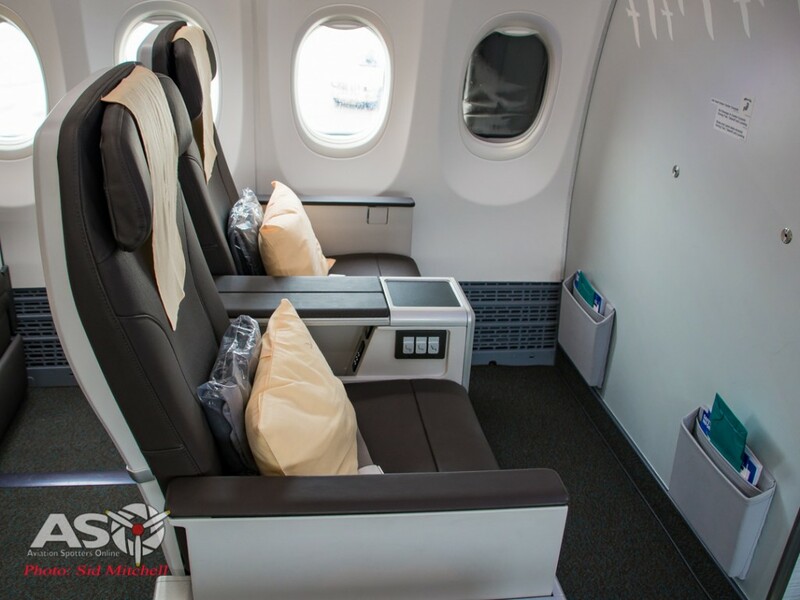 Business class seating has an increase of 25% in seat spacing – from 990mm to 1245mm and the seats recline and extra 330mm for increased passenger comfort, plus have additional personal item storage pockets. 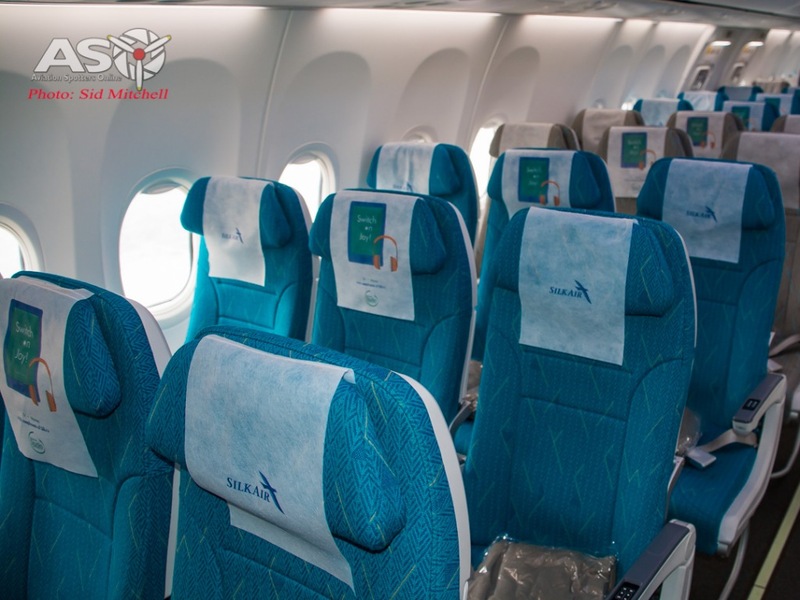 Business Class also is treated with freshly brewed gourmet coffee from Illycafe. Business Class – row 1. 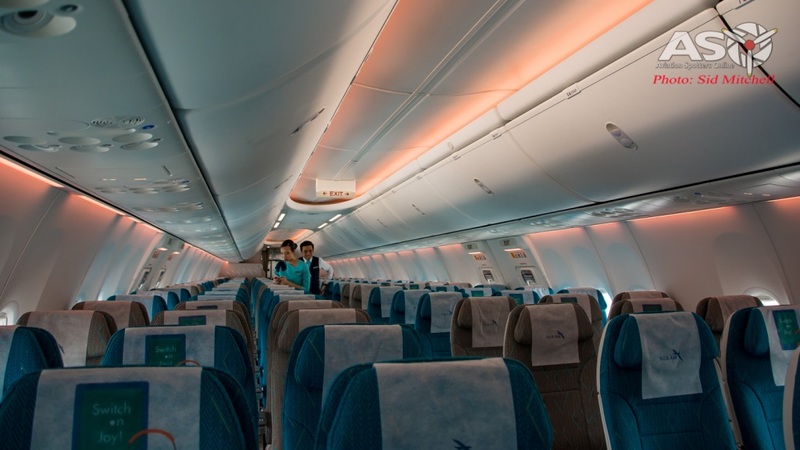 Both Business and Economy seats are provided with USB charging ports and the SilkAir Studios in-flight wireless system has been upgraded to provide an improved entertainment streaming package to passenger’s own devices. Two tone fabric upholstered sesting in Economy cabin. 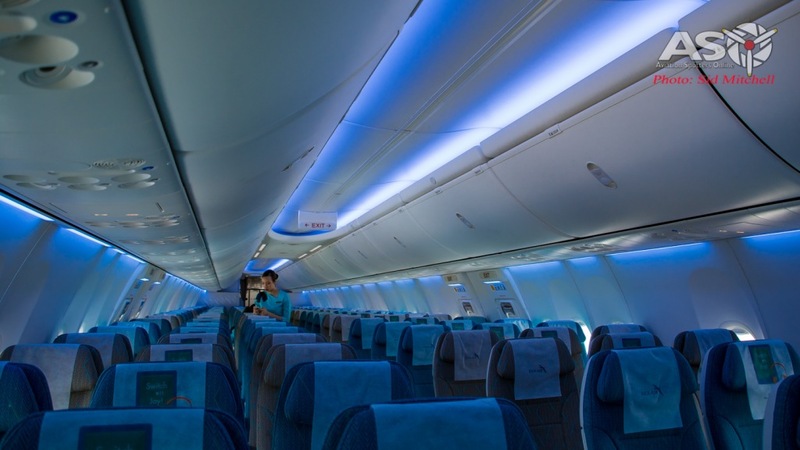 While viewing the main cabin there was a subtle lighting change that transitioned from cool blues to warmer sunset hues – it was explained that the LED lighting can enhance the ambience and makes for a more enjoyable flying experience in conjunction with the new dual colour scheme of the fabric upholstery. Warm LED lighting to match the time of day. As the return flight passengers were almost ready to board for MI802, our time was up and we moved down to the tarmac – the opportunity to take some ground level photo’s presented itself again as the he ground crew disconnected the tug and bar, so that the Business partners could be photographed holding the Welcome to Darwin Silk Air banner, with 9V-MBC as a fitting backdrop. Unfurling the banner by executives – a last photo op before departure. As the rain started to spit we left the apron for the dry terminal interior and proceded to hand our security passes back. I thanked Bob and Jill for their time and said I looked forward to seeing the MAX 8 back in Darwin soon. 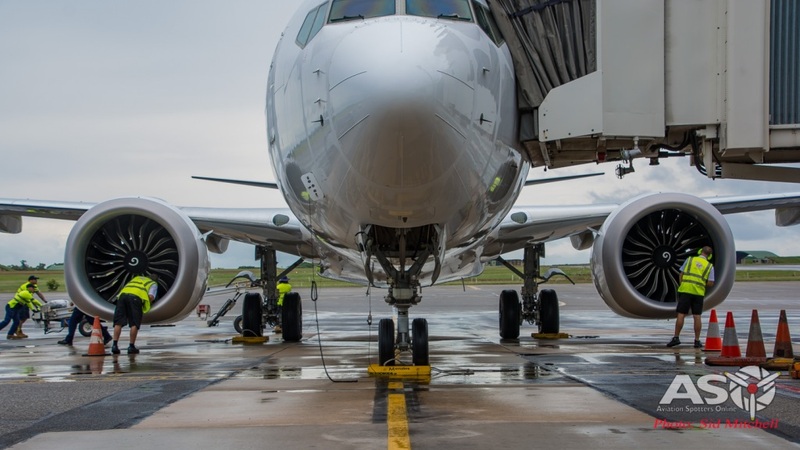 With two extra flights to Darwin we can expect even more Singaporean visitors to the Northern Territory, and more Australian travellers heading to one of the largest airline hubs in S.E Asia. Today’s welcome message on what is normally the flight status board. I figured I had just enough time to catch 9V-MBC from the end of the runway departing back to Changi Airport as I left the Terminal. SLK802/MI802 lifted off at 4:16pm, 1hr 40min after landing. Departing as SLK802 to Changi. 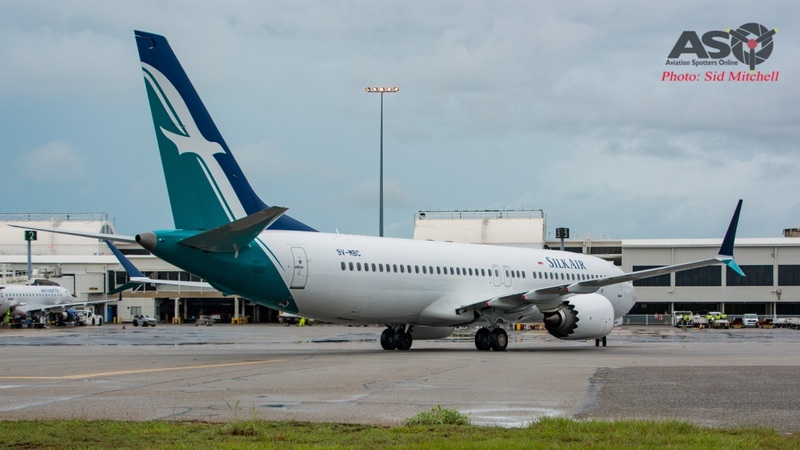 Although this aircraft was not the first Boeing 737 MAX 8 to visit Darwin – Boeing’s own aircraft N8704Q was in the Northern Territory performing trials in January 2017, we will certainly be seeing a lot more of the Silk Air fleet in years to come. 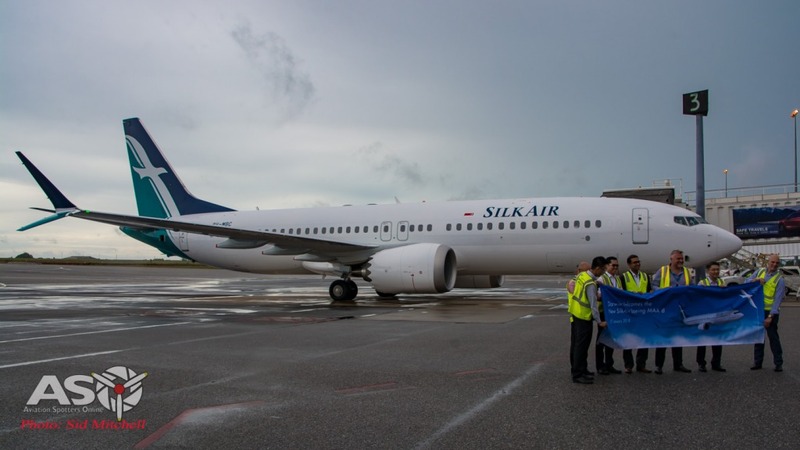 I would like to thank Maria, Bob and Jill, the staff at Darwin International Airport and SilkAir for making this day possible and I look forward to the next visit. Darwin really is bit of a unique place and we do get some opportunities to catch a surprising variety of aircraft as they pass through. 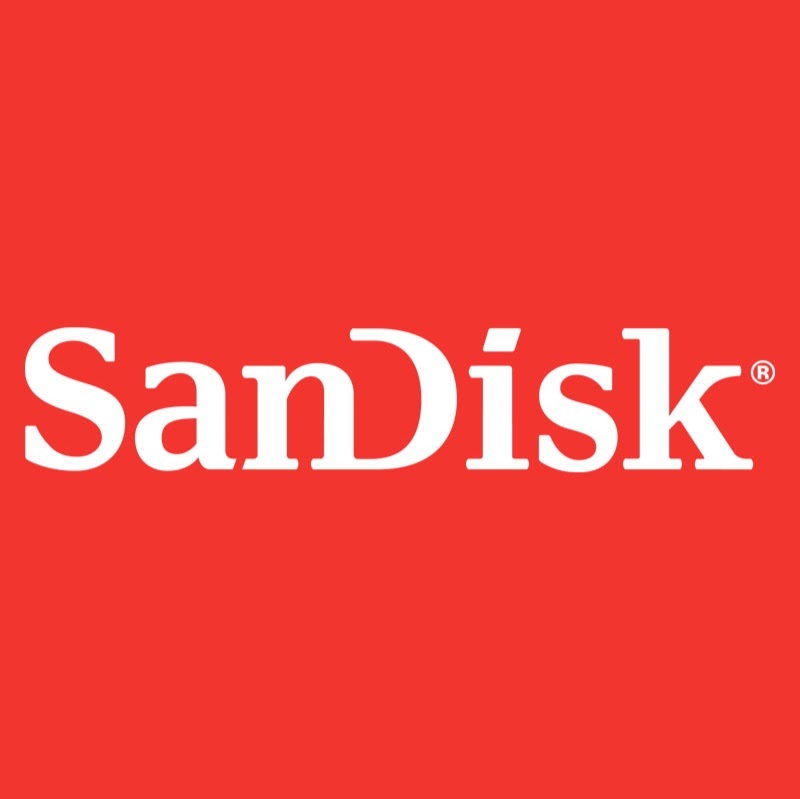 Thanks for sharing photos Sid. Your weather looks similar to what we are experiencing at the moment in southern Tablelands NSW. Your most welcome John. A nice looking aircraft and the next flight is due into Darwin tomorrow -Wednesday 10th. And a pity we can’t share the wet weather into those fire zones down south, they could do with it.